It's not a free ride to the NHL. Veteran journalist Ken Campbell and hockey industry insider Jim Parcels expose the high cost of pursuing Canada's national dream in a new book Selling The Dream : Paying the NHL price…on and off the ice. Both Ken Campbell and Jim Parcels have been involved in the game at different levels for the better part of two decades. Selling the Dream takes a hard look at Canada's national pastime and exposes the real issues faced by parents today; the realities of advancing to hockey's highest level in an elite system, the increasing costs of playing minor hockey, the expected career duration in each league, and the odds of playing in the NHL. Costs now prohibit a huge number of potential players from advancing to the NHL. Drawing on research and experience, the authors expose some of the misconceptions around playing junior, college and professional hockey, telling the stories of the extremes some parents go to advance their children in the game. The investment, say the authors, is much more than just money. Elite hockey players intent on making the NHL chase the dream, often at the expense of education, social development and other opportunities. The investment is just as much emotional as it is financial. Two summers ago, Ken Campbell did a story on the cost of producing an NHL player and used Calder Trophy winner Patrick Kane as a prime example. After sitting down and crunching the numbers with his parents, they came to the conclusion that the total cost of Kane's NHL career was about $250,000. Considering that Kane will earn $6.5 million next season and an average of $6.3 million over the next five as a member of the Chicago Blackhawks, this looks like a very wise investment. But when you consider that the odds are thousands-to-one against playing so much as a shift in the NHL, that money might just as easily been seen as a very expensive lottery ticket. Hundreds of players (and their parents) make the sacrifice and have nothing to show for it. 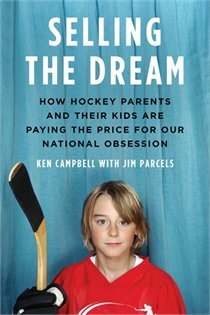 Campbell and Parcels showcase the successes and failures of Canadian players who have passed through the system, and tell the stories of the parents who have gone to the extreme to elevation the profile of their hockey playing progeny. Is the Canadian junior hockey system equivalent to child slavery? Who are the money makers? Has commercialization killed the dream? Campbell and Parcels identify those who are making money off the dream at all levels of hockey: from arena operators, minor hockey team owners, personal coaches and scouting services. Selling the Dream is a must-read for parents and players before they make the decision to pursue a hockey career. It's a book for all Canadians who love the game.